It’s that time of the year again when kids everywhere are heading back to school. No more playing video games all day, no more lounging around the pool, and no more afternoon siestas. It’s time to say goodbye to our lazy summer days and get back into the swing of things. This might mean getting back on the football field or tennis courts for our student athletes, running from one end of the campus to the other for our college students, and standing for hours at a time for our teachers and professors. Going from a sedentary lifestyle to more activity in a short time can definitely take a toll on your feet. In fact, it can increase your risk of getting stress fractures. When people hear the word fracture, they generally think of a broken bone. They associate it with some sort of known traumatic event such as falling or dropping something on their foot. However, did you know that not all fractures are due to trauma? There’s another type of fracture called a stress fracture. A stress fracture frequently occurs due to increasing the amount or intensity of an activity too quickly. Normally, bone can gradually adapt to increased pressure through a process known as remodeling. Remodeling allows for the destruction and rebuilding of bone so that it is stronger. However, if there a lot more pressure over a short period, the bone does not have enough time to adapt thus leading to increased stress to bone. This causes increased inflammation inside the bone and tiny hairline fractures to outside of bone. Who is at risk for a stress fracture? Patients who increase activity or start a new exercise regimen over a short time are the most susceptible to stress fractures. That’s why it’s always important to slowly transition into activities and allow your feet and bones to acclimate to increased loads. Structural deformities such as a bunion can cause overloading to lesser metatarsals resulting in pain. Increased weight over a short time will also cause strain to your feet. Wearing softer soled shoes like Converse, Vans, and Toms will reduce foot stability and increase risks of stress fractures. Remember that your feet carry all the weight of your body and you need to give them the proper support with stable rigid shoes and even orthotics. ​Females with osteoporosis, medications such as prednisone, and vitamin d/calcium deficiencies are also more susceptible to fractures in general due to softer bone integrity. Symptoms include insidious pain with weight-bearing and improvement with rest. Pain is generally on the top of a foot. Swelling and skin discoloration can also be seen sometimes too. Most patients point to a generalized area but with clinical assessment, podiatrists can generally pin point the area of the fracture. A tuning fork can also be useful in identifying a stress fracture. A tuning fork is generally used to assess nerve sensation. In a normal exam, the tuning fork’s is placed on a specific bone and patient should only feel a vibration. In the area of a stress fracture, patients will feel pain secondary to fracture. 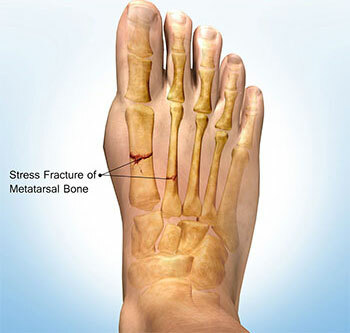 The most common location to get a stress fracture is at the 2nd metatarsal or long bone associated with your 2nd toe. Other common bones affected include the lesser metatarsals and tibia and fibula. Treatment for stress fracture includes immobilization in walking boot for 4-6 weeks. Stress fractures are unfortunately not always seen on x-ray. For this reason, they’re often misdiagnosed. In order for them to appear on films, there must be at least 30-50% decrease in bone density. If patient have been walking on stress fracture for a long time, a bone callous will form around the fractured bone. The best way to determine if a stress fracture is present or not is an MRI. An MRI will take a 3D image allowing us to see both the inside and outside of each individual bone. It will show where there’s inflammation associated with pathology. However, MRI’s are not always necessary, and diagnosis can be based off patient history and clinical symptoms. What are the treatments for stress fractures? 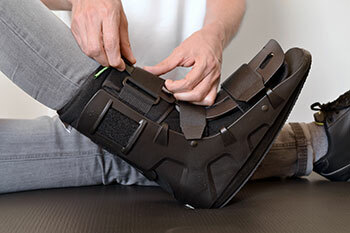 Treatment for stress fracture includes immobilization in walking boot for 4-6 weeks. If specific bones such as the heel bone are affected, we may completely immobilize foot with crutches depending on pain. Anti-inflammatory medications are great at helping reduce swelling. Stress fractures generally heal and surgical intervention is rarely required. However, it is always a good idea to find out why a patient may have gotten a stress fracture in the first place to prevent future injuries. It’s our goal at UFAI to start you off on the right foot this school year and help prevent injuries throughout. 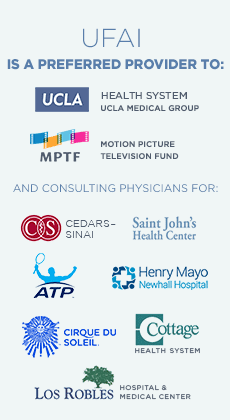 If you would like more information about stress fractures or any other foot and ankle condition, we encourage you to call us (877) 736-6001 at or visit us at www.footankleinstitute.com.